I don't especially like living in the suburbs, but at least it's close enough to the edge of town for a small amount of wildlife to pass through. I'll occasionally hear (and, more rarely, see) a screech owl in the back yard, and once what I think might have been a great horned owl. A pair of Cooper's hawks were in the area for a couple of days this week, though I think they may have moved on by now. 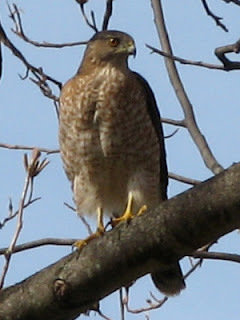 Last year I saw a hawk (I don't know what kind it was) trying to catch a squirrel in the back yard. It dove from a low branch and couldn't get up much speed, so it missed on its first try, and the squirrel seized the opportunity to scamper up a tree trunk. The hawk flew up into that same tree, perching less than a dozen feet from the squirrel, which hunkered down against the bark. The hawk extended its wings a few times, clearly trying to work out a way to get around the intervening branches before the squirrel could escape; it started out one way, then stopped and tried another direction, and another, and then it moved to a different branch and made a couple more false starts, and each time the squirrel tensed up to dart around the trunk to safety. Eventually the hawk gave up and took off without ever making its move; maybe it had already had lunch.